Knowledge of the full scope of federal programs that can influence coastal flood risk is necessary to move towards more effective, adaptive management of changing coastal hazards and ecosystems. This section of the report serves as an overview of federal programs with either a direct or indirect nexus to coastal flood risk management as well as the federal policy framework under which these programs operate. Each program within the scope of the report is summarized, and individual program’s responsibilities, roles, and connections to other federal agencies are identified. Federal programs are also evaluated in terms of their compatibility with the coastal flood risk management objectives of the Association of State Floodplain Managers (ASFPM) and Coastal States Organization (CSO) for: increasing capacity of state coastal zone management programs, exploring alternatives to structural flood risk mitigation, incorporating long-term planning for flood risk into management efforts, achieving a balance between investment in flood risk mitigation and disaster recovery, and adopting a holistic approach to coastal flood risk management. The report also highlights cases in which federal programs may conflict with these management objectives. Users seeking more detail on specific federal policies and programs can find supporting documentation on the Holistic Approach to Coastal Flood Risk Management Resources page. Executive Order 11988: Floodplain Management, established in 1977, is one of the principal documents guiding federal floodplain management. The order requires agencies to evaluate the potential effects of actions in floodplains and to avoid any adverse impacts that may result from such actions where possible. The order directs agencies to take action to reduce flood risk, lessen flood impacts on human safety and welfare, and restore and preserve the natural and beneficial functions of floodplains. These provisions apply to the acquisition, management, and disposal of federal lands and facilities, federally undertaken, financed, or assisted construction and improvements, and federal programs and activities affecting land use within floodplains. Any new federal construction in a floodplain must comply with the National Flood Insurance Program 1% annual chance floodplain construction standards at a minimum, and structures must be elevated to meet compliance standards rather than use fill. The order also requires federal agencies to inform private parties involved in floodplain-related transactions of any hazards associated with structure locations if the federal agency guarantees, approves, regulates, or insures any aspects of the transaction. Determine whether the proposed agency action lies within the 1% annual chance floodplain. Provide for public review and notice of the proposed action. If the action is located in a floodplain, evaluate alternatives including relocation outside of the floodplain. Determine the impacts of the proposed action. If the impacts of the proposed action cannot be avoided using a practicable alternative, employ measures that minimize impacts to the floodplain as well as restore and preserve beneficial floodplain functions. Present findings and offer a public explanation. Also adopted in 1977 and considered a sister order to EO 11988, Executive Order 11990: Protection of Wetlands is designed to both reduce the loss and degradation of wetlands and preserve and enhance the beneficial values of wetlands. In a similar manner to EO 11988, EO 11990 instructs federal agencies to avoid construction in wetland areas if feasible alternatives exist. Agencies must also minimize any potential damage if construction within wetlands cannot be avoided. Federal Agencies must give public notice for any proposed construction within wetlands, and any lease or sale of agency wetlands is subject to wetland preservation restrictions. Again mirroring EO 11988, EO 11990 applies to the acquisition, management, and disposal of federal lands, any construction or improvement projects which are undertaken, financed, or assisted by federal agencies, and any federal activities or programs that affect land use. Implementation guidelines require federal agencies to follow the same eight-step process as seen in EO 11988, first determining if a federal project is located within a wetland area then conducting an assessment of potential alternatives and providing opportunity for public review. Additional feet of freeboard above the 1% annual chance flood elevation. Planning based on the 0.2% annual chance flood event. A climate-informed science approach must utilize best-available, actionable data and methods that integrate current and future changes in flooding based on climate science. The freeboard approach requires two feet of freeboard for non-critical structures and three feet of freeboard if a project is deemed critical. Executive Order 13690 also amends EO 11988 to emphasize the use of ecological processes and nature-based approaches, both in the development of flood risk mitigation alternatives and as a means to increase the resilience of federal projects within floodplains. The National Flood Insurance Act of 1968 first established the National Flood Insurance Program (NFIP) in response to the growth of economic loss and social distress associated with flood disasters. Flood disaster protective measures prior to the act had proved insufficient, and so the NFIP was created as a means for the federal government to share risk of flood losses as well as encourage preventative and protective measures against flood disasters. The 1968 act first established flood insurance purchase requirements for structures with federally backed mortgages located within high-risk flood areas and put forth elevation requirements for new and substantially improved structures in communities participating in the NFIP. Several pieces of legislation have been introduced as reforms to the Flood Insurance Act of 1968. The Flood Insurance Protection Act of 1973 further extended flood insurance purchase requirements to properties located in high-risk flood areas that are used to secure loans. The National Flood Insurance Reform Act of 1994 was focused on mitigation, establishing mitigation insurance and creating a mitigation assistance program to reduce flood damages. The Flood Insurance Reform Act of 2004 introduced a number of measures, including provisions to reduce losses from properties that have made repetitive flood insurance claims and floodplain education requirements for insurance professionals working in high-risk flood areas. A recent major reform to the Flood Insurance Act of 1968 was the Biggert-Waters Flood Insurance Reform Act of 2012.The act established a national floodplain mapping program and increased premiums for those properties that had been receiving subsidies, beginning a movement of flood insurance premium rates toward full actuarial risk. Following the Biggert-Waters Act there were concerns of flood insurance affordability, and the Homeowner Flood Insurance Affordability Act of 2014 was drafted in response. The Homeowner Flood Insurance Affordability Act offset parts of the Biggert-Waters Act by limiting certain flood insurance premium rate increases and restoring the practice of grandfathering NFIP policies, and also created an annual policy surcharge to improve the fiscal soundness of the NFIP. 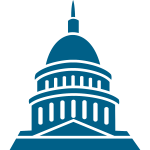 Floodplain-related policies and programs are generally formulated and funded by congressional authorization and appropriations committees and subcommittees. As many as 15 standing committees in the House of Representatives and 43 standing subcommittees in the Senate have potential jurisdiction over programs related to coastal issues. Given the broad range of issues encompassed by coastal flood risk management, programs can be centered in committees with little obvious overlap. As an example, the NFIP is currently housed in the House Financial Services Committee and Senate Banking Committee, while the House Transportation and Infrastructure Committee and Senate Environment Public Works Committee have jurisdiction over the U.S. Army Corps of Engineers flood control program. Federal agencies involved in floodplain management have acknowledged the need for collaboration in management efforts and have taken steps to further inter-agency cooperation. The Federal Interagency Floodplain Management Task Force (FIFM-TF) was established in 1975 and consists of representatives from the U.S. Army Corps of Engineers, Federal Emergency Management Agency, Department of Agriculture, Department of Commerce, Department of Defense, Department of Energy, Department of Housing and Urban Development, Department of the Interior, Department of Transportation, Council on Environmental Quality, Environmental Protection Agency, General Services Administration, and Tennessee Valley Authority. The Task Force works to achieve the goals and pursue the strategies set forth in the Unified National Program for Floodplain Management, including formalization of a national goal-setting and monitoring system for floodplain management, reduction of risks to life, property, and natural resources of floodplains, implementation of a process to encourage positive attitudes towards floodplain management, and establishment of in-house floodplain management capability nationwide. The Task Force also publishes guidance and recommendations on federal floodplain management, although recommendations do not supersede the legislative requirements, missions, or policies of federal agencies. A number of federal floodplain management efforts also fall under the purview of the Mitigation Framework Leadership Group (MitFLG), which works to coordinate federal agency risk mitigation efforts, integrate delivery of core mitigation capabilities, and assess the effectiveness of mitigation capabilities across the nation. Core mitigation capabilities are defined in the National Mitigation Framework and include threat and hazard identification, risk and disaster resilience assessment, planning, community resilience, public information and warning, long-term vulnerability reduction, and operational coordination. MitFLG is composed of many of the same departments and agencies as the FIFM-TF as well as representatives from state, local, tribal, and territorial governments. While federal agencies and programs play a large role in formulating and coordinating coastal flood risk management efforts in the United States, state and local governments remain responsible for the land-use regulations and development decisions that are at the heart of sound coastal flood-risk management practices. Though disaster declarations, flood insurance, and major coastal infrastructure projects are primarily federal responsibilities, the governance structure of flood risk management in the United States is such that shared responsibility across multiple levels of government is necessary in order to effectively manage coastal flood risk. Aspects of coastal zoning and flood risk management have ties to the idea of “takings” put forth in the Fifth Amendment to the U.S. Constitution, which requires that private property shall not be taken for public use without just compensation. Unjust takings can occur in cases in which a government entity has permanently occupied private property, denied all economically viable use of a property, or reduced private property value at a scale incompatible with landowner impacts. A taking can also occur when an exaction is involved. Takings associated with loss of economic value, as seen in Lucas v. South Carolina Coastal Council, are most relevant to coastal flood risk management as regulations often alter or restrict coastal land use. Despite this definition of unjust takings, courts have frequently upheld coastal regulations if their intent is to prevent dangerous uses of coastal areas. For cases in which risk to life may occur, agencies may rely upon conservative courses of action provided they are supported by sound science and engineering. Such conservative courses of action include establishing restrictions on land-use within flood-prone areas, even if property values are substantially reduced as a result. In general, U.S. law supports preventative measures by state and local agencies that intend to ensure the safety, health, and welfare of coastal communities. In terms of future liability, the potential for government entities to be held responsible for allowing activities that cause or increase coastal flood risk often outweighs any repercussions that might result from enacting regulations that prevent future flood damages. A number of major federal environmental regulations have a nexus to coastal flood risk management. A collection of such regulations are listed and summarized below and explored in further detail within agency and program descriptions. The Endangered Species Act of 1973 was created in response to the threats posed to wildlife, fish, and plants from continued economic growth and development within the United States. The act requires federal agencies to consult with the U.S. Fish and Wildlife Service (USFWS) or the National Oceanic and Atmospheric Administration (NOAA) to determine whether a federal action will have an adverse impact on the existence of listed endangered species or the critical habitat of such species. The act also prohibits any takings or trade of listed endangered species. The National Environmental Policy Act, enacted in 1969, established a broad policy framework for environmental protection in the U.S. The act created the formal requirement that federal agencies consider the environmental impacts of their actions and the impacts of potential alternative actions. These impacts are presented in the form of Environmental Assessments (EAs) and Environmental Impact Statements (EISs). The act additionally established the Council on Environmental Quality within the Executive Office of the President. The Coastal Zone Management Act was passed by Congress in 1972 to address continued growth and development in the coastal zone. The primary goal of the act is to preserve, protect, develop, restore, and enhance coastal resources along the Gulf, East, and West coasts as well as the Great Lakes. The act established three programs to carry out this mission: the Coastal and Estuarine Land Conservation Program, the National Estuarine Research Reserve System, and the National Coastal Zone Management Program. The Coastal Barrier Resources Act of 1982 was also designed to address the impacts of coastal development, specifically development on lands that serve as coastal barriers. The goals of the act are to minimize loss of life, reduce wasteful expenditures, and protect natural resources by discouraging development in high-risk coastal areas. The act established the Coastal Barrier Resource System, which consists of coastal lands where federal development expenditures and assistance are restricted, including the purchase of flood insurance through the NFIP. The basic structure of the Clean Water Act was initially put forth in the 1948 Federal Water Pollution Control Act and then later expanded in 1972 to form what is now known as the Clean Water Act. The 1972 act established a national framework to address water quality issues within the United States by regulating pollutant discharges into water bodies and creating water quality regulation standards for surface waters. The act also established permit requirements for the discharge of any pollutant from a point source into a navigable waterway, implemented through the National Pollutant Discharge Elimination System. Water resource infrastructure at the federal level is authorized through Water Resource Development Acts (WRDA), and federal water resource projects are carried out through the United States Army Corps of Engineers (USACE). The purpose of the WRDAs is to provide for the conservation and development of water and related resources and to authorize the Secretary of the Army to construct improvement projects on rivers and harbors of the United States. USACE planning efforts are guided by the Economic and Environmental Principles and Guidelines for Water and Related Land Resources Implementation Studies, commonly referred to as the Principles and Guidelines or P&G. The P&G were developed in 1983 and established national economic development as the primary objective for federal water resources planning activities. In a recent major reform effort the 2007 WRDA called for the Secretary of the Army to revise the P&G to include planning for objectives beyond economic development. The act established a National Water Resources Planning Policy, the priorities of which include maximizing sustainable economic development, avoiding the unwise use of floodplains, and protecting and restoring the functions of natural systems. The White House Council on Environmental Quality published updated Principles, Requirements, and Guidelines (PR&G) in response to the call for reform. The new PR&G expand the scope of water resources planning to include healthy and resilient ecosystems, sustainable economic development, floodplain considerations, public safety, environmental justice, and a watershed approach. Updates also broaden the range of federal investments that the guidelines apply to. Interagency Guidelines have also been published, but specific actions addressing the expanded PR&G have yet to be implemented in federal water resources development activities. The Stafford Disaster Relief Act established current federal disaster relief procedures in order to address the disruption of the normal function of state governments that occurs when disaster events exceed the capacity of state emergency relief efforts. Under the act the federal government is authorized to provide assistance to states and localities following a presidential declaration of a major disaster or emergency. Declarations can be made after a state governor request following the execution of a state’s emergency management plan and demonstration that supplemental federal assistance is needed, or a declaration may be made directly by the president in the event that a disaster falls under an area of primary federal responsibility. Federal aid can be provided in a variety of ways including technical, financial, and logistical assistance.